Condor Airlines celebrated its first nonstop flight from Munich to Las Vegas on Wednesday, May 3. The flight will operate twice a week, every Wednesday and Saturday, introducing Las Vegas to prospective German and European visitors. Including existing nonstop flights from Frankfurt, Condor Airlines now offers six nonstop flights from Germany to Las Vegas. The Boeing 767-300 will provide economy, premium, and business class seating. For more information, contact Heidi Hayes, LVCVA, hhayes@lcva.com. The Venetian Las Vegas launched one of the hospitality industry’s first Facebook Messenger direct booking channels and the first for an individual hotel, offering guests the opportunity to book directly and securely through social messaging. By automatically analyzing and learning the guests’ conversational patterns, the application will continually improve its vocabulary and functionality to serve guests. For more information, contact Elaine Chaivarlis, The Venetian and The Palazzo, Elaine.Chaivarlis@sands.com. Caesars Entertainment has added newly renovated suites to its most exclusive collection of luxury accommodations across its portfolio of Las Vegas resorts. As part of Caesars Suites, formerly Anthology Suites, more than 2,000 suites and villas are available to view and book online via one comprehensive new website, www.CaesarsSuites.com. From the beginning of 2016 to the end of 2017, Caesars Entertainment Las Vegas will have renovated more than 800 suites, featuring a diverse array of options throughout the destination for every traveler and occasion. For more information, contact Erica Johnson-McElroy, Caesars Entertainment, Ejohnsonmcelroy@caesarspalace.com. To celebrate the industry and the people who work in it, the Las Vegas Convention and Visitors Authority (LVCVA) hosted a series of events and activations May 7-13 in conjunction with National Travel and Tourism Week. The rally on May 9 featured performance vignettes by cast members of Las Vegas stage shows BAZ – Star Crossed Love, The Australian Bee Gees Show, and a cappella group Vox Vegas. For more information, contact Maria Phelan, LVCVA, mphelan@lvcva.com. Life is Beautiful Music & Art Festival has revealed the daily music lineups for the 2017 festival taking place Sept. 22-24. Single day tickets are still available for purchase on their website at lifeisbeautiful.com. The fifth-annual three-day event will return to Downtown Las Vegas with performances by marquee musicians including Chance the Rapper, Muse and GORILLAZ; numerous works of art by internationally known artists such as Meow Wolf, Matt Skiba and Shepard Fairey; a thought-provoking speech by Bill Nye and much more. For more information, contact Devin Aaron, R&R Partners, devin.aaron@rrpartners.com. Caesars Entertainment Corporation announced that, as part of its continued commitment to providing guests with the best possible experience, the company will be launching a $90 million complete renovation of 1,270 rooms at Flamingo Las Vegas. The renovation will begin in late August 2017, with the first guest arrivals expected in November 2017, and final completion of all rooms expected in the second quarter of 2018. The fully renovated rooms will feature unique, contemporary and retro-chic designs with accents that celebrate Flamingo’s rich history as the centerpiece of the Las Vegas Strip. For more information, contact Erica Johnson-McElroy, Caesars Entertainment, Ejohnsonmcelroy@caesarspalace.com. Internationally inspired with masterful techniques, Chef Brian Howard's newest project, Sparrow + Wolf has opened in Las Vegas’ hottest off-strip culinary neighborhood. With a menu influenced by Chef Howard’s travels, coupled with slices of regional American cuisine, Sparrow + Wolf offers an ever-evolving menu of flavors and techniques, anchored by live-fired cooking and true hospitality. In addition to the menu, Chef Howard and team offer a nightly Chef’s Table dinner, featuring a new menu and experience each week. For more information, contact Katie Conway, Revenue Media Group, Katie.Conway@revenuemediagroup.com. 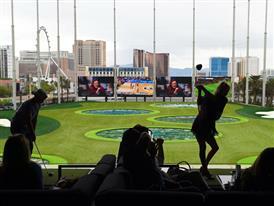 Get ready to party all summer long at Topgolf Las Vegas with the launch of their Hideaway Pool. Unique to Topgolf, the pool features a swim-up bar and a colossal poolside screen while summertime brings an array of special events and live entertainment. The pool is open to the public with no entry fee, and lounge chairs and day beds are available on a first-come, first-serve basis. Guests can enjoy food and beverage service on the pool deck from Topgolf’s extensive menu. For more information, contact Alissa Kelly, PR Plus, alissa@prpluslv.com. Debuting appropriately on Mother’s Day, Chica Las Vegas serves a refreshing take on authentic, home-style Latin cuisine by Celebrity Chef Lorena Garcia. This is the newest hand-crafted concept from John Kunkel’s 50 Eggs and the creator of The Venetian’s award-winning Yardbird Southern Table & Bar. Chica will be the property’s first Latin concept and the first of its kind in the Las Vegas market. For more information, contact Jennifer Cornet, Bread and Butter PR, jennifer@breadandbutterpr.com. On April 28, Chef Gordon Ramsay announced live to his fans on Facebook plans for the first-of its-kind Gordon Ramsay HELL’S KITCHEN located at Caesars Palace Las Vegas and set to open this winter. This marks Ramsay’s fifth Las Vegas restaurant and extends his successful partnership with Caesars Entertainment. Masterfully designed by Jeffrey Beers International to be an experiential and immersive destination restaurant, guests will be transported to the studio set. For more information, contact Celena Haas-Stacey, Caesars Entertainment, chaas@caesars.com. The world’s tallest observation wheel, the High Roller at The LINQ Promenade, introduces a new, booze-infused selection of chocolate pieces for its indulgent Chocolate Tasting Experience. Crafted by Ethel M Chocolates, these delectable bonbons contain crème fillings spiked with real flavored liqueurs. Guests can savor four distinctive pieces, along with a glass of wine, while enjoying the best views of Las Vegas from 550 feet in the air. Tastings are available every Thursday from 5 p.m. to 8:30 p.m., with the final experience of the night taking place at 8 p.m. For more information, contact Erika Pope, Vox Solid Communications, epope@wearevoxsolid.com. Boulevard Food Court, a concept created by venture capitalist Darin Feinstein, offers an easily accessible, value-priced, fast-casual dining destination to the thousands of tourists walking Las Vegas Boulevard. Offering eight unique specialized dining concepts, the destination food court exhibits carefully curated menus with premium ingredients and classic items with a memorable twist. Boulevard Food Court is open 24 hours and located at 3755 South Las Vegas Boulevard across from the Monte Carlo Hotel & Casino. For more information, contact Chandra Knee Stepanovich, Red Mercury Entertainment, chandra@redmercuryent.com. Opening June 30 at Miracle Mile Shops, The Tipsy Robot is a one-of-a-kind revolutionary jaw-dropping Las Vegas bar attraction with wow factor. Robotic arms perfectly create the drink you design from their app. Robots mix, shake and even dance while mixing your beverage and sharing your experience is easy with a state-of-the-art Instagram photo booth with incredible backgrounds. For more information, contact Evan Korn, Brain Trust Agency, evan.korn@braintrustagency.com. Renowned Chicago restaurant group Hogsalt is the latest collaborator announced by MGM Resorts International and New York-based Sydell Group as part of the Park MGM culinary experience. Bavette’s will make its mark on Las Vegas this October. Like its Chicago sibling — feted by Esquire, Zagat, Food & Wine, OpenTable - the new Bavette’s will deliver decadently reimagined steakhouse fare with a dash of French flair. The eclectic menu will feature multi-story seafood towers, a bone-in dry aged ribeye, and a curated cocktail and wine program will embrace Bavette’s 1920s speakeasy vibe. For more information, Contact Natalie Mounier, Kirvin Doak, nmounier@kirvindoak.com.